Wichita, Kansas, has fun and affordable activities for the entire family during spring break. Take a look at these five suggestions for special events or themed days that will keep your group entertained. Exploration Place offers visitors of all ages interactive environments, hands-on experiences, Kansas’ largest domed theater – the Boeing Dome Theater and Planetarium – imaginative spaces and outdoor recreation, all located on a 20-acre site along the scenic Arkansas River in downtown Wichita, Kansas. In addition to exploring the exhibits and film, visitors can enjoy programs and activities related to the exhibits during spring break. All are included with museum admission unless otherwise noted. Activities can change without notice, call ahead to confirm. Daily, unless otherwise noted. Subject to change without notice. Spring Break Edventures: Participants in grades kindergarten through 5 can spend their spring break with ice age-themed activities. Price (per day) Member: $30/Nonmember: $35 Registration required: 316-660-0620 or http://exploration.org/programs/parents/spring-break-edventures/. 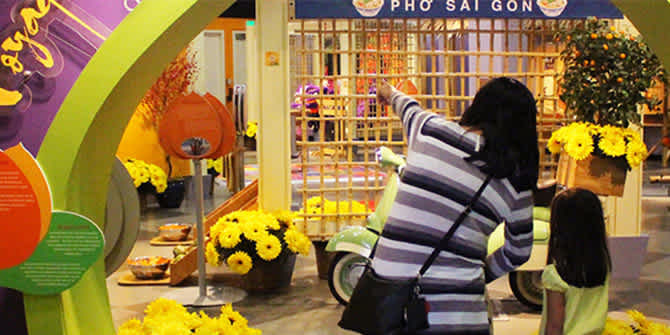 Immerse yourself in Vietnamese culture with special dances, fashion shows, food, music and more. Create a rubber band jump rope. Practice Vietnamese calligraphy, make ornaments, lion dance puppets and your own firework painting. Kick off the day with fireworks and a performance by the St. Anthony Lion Dance Team. Then enjoy Vietnamese food at the Vendor Marketplace (11 a.m.-2 p.m.). Learn Vietnamese vocabulary, such as colors, numbers and food. Listen to classical Vietnamese music. Meet the Vietnamese Pageant Court. Talk with local Vietnamese volunteers wearing different clothes that represent the culture. Take a selfie with props including fans, dress, lanterns and more. Assemble a rubber band jump rope. Listen to classical Vietnamese music. Write your favorite wish and add it to lucky trees. Put on your dancing shoes and try a short routine with the Vietnamese Student Association. Enjoy classical Vietnamese music. Create a firework painting and make lion dance puppets. Play Vietnamese games including and _. Learn Vietnamese calligraphy. Find out about the five fruits on the Tet celebration’s ancestral altar. Learn the basics of eating at a Vietnamese restaurant. Make your own spring roll with the help of Vietnamese volunteers. Admission: $4 (plus tax). Put on your dancing shoes and try a short routine with the Vietnamese Student Association. Create lion dance puppets and your own firework painting. Play Vietnamese games, including and more. Meet and take your picture with Miss Vietnam and the Vietnamese Pageant Court. Enjoy a showcase of , the national dress of Vietnam. Learn Vietnamese vocabulary, such as colors, numbers and food. Interact with the lion dance performed by Phap Hoa Temple Lion Dance Team and enjoy the Vietnamese Student Association as they perform a cultural dance while wearing traditional clothing. Meet and talk with Miss Vietnam and her Pageant Court. Create a firework painting and make lion dance puppets. The week-long Week of Heroes event features activities for the whole family included in regular admission to the Museum of World Treasures, which features three floors of eclectic pre-history to modern day artifacts. Everyone will be celebrating the heroes of yesterday and today with fun stations around the museum and special guests from the community. Discover heroes in local, national and world history. Meet local heroes: veterans, active duty service members, police, firefighters and more. Enjoy themed crafts, focusing this year on “The Grand Ole” Flag, and educational activities all week! Every child in attendance will receive a prize bag, lectures of all types will be hosted throughout the week and the event will spill onto the plaza with military vehicles, an F4 fighter simulator and vehicles of various first responders. Consider a “zoocation” at Sedgwick County Zoo or one of the most interactive animal parks in the country, Tanganyika Wildlife Park. The Sedgwick County Zoo is the seventh-largest zoo in the U.S. and the state’s most-visited outdoor attraction. The zoo is home to more than 3,000 animals of nearly 400 species. See orangutans, chimpanzees, gorillas, tigers, penguins and the Elephants of the Zambezi River Valley, the third-largest elephant exhibit in the country. Find the daily schedule on the zoo’s website if you want to time your visit with an animal feeding. Opening day at Tanganyika Wildlife Park is March 17 and there are sure to be plenty of animal babies to see. Tanganyika specializes in wildly different animal encounters. In addition to viewing the animals, guests can interact with some of the animals in the collection, from riding a camel to petting a kangaroo to feeding a lemur, giraffe or lorikeet. If you want to get active on spring break, Wichita has many indoor and outdoor options. Enjoy scenic views at nature trails like the Great Plains Nature Center or Pawnee Prairie Park. For more fun, visit O.J. Watson Park for pony rides and paddle boats. You’ll find more than 80 miles of paved paths at over 125 Wichita parks. Indoors, consider a public ice skating session at the Wichita Ice Center, call ahead to the $14 million sports complex Wichita Sports Forum to find out what sports courts are available for open play or catch some air at the forum’s Aviate indoor trampoline park. Urban Air is a 30,000-square-foot park in west Wichita packed with large trampolines, foam-block pits, basketball hoops and a dodge ball arena. This year is the 150th anniversary of the Chisholm Trail and you’ll find events for all ages throughout Wichita commemorating the city’s role in the cattle drives. Read our blog post on the 150th celebration for details about a series of events during spring break at the Wichita Public Library. You can experience Wichita like it’s 1865 at Old Cowtown Museum, a living history museum that lets you immerse yourself in the sights, sounds and activities common to a Midwestern cattle town. Hear the ring of the blacksmith anvil, try an ice-cold sarsaparilla in the saloon and be prepared to duck in the doorway as gunfire erupts in the streets! Wichita Art Museum’s art never goes on break, so join the Wichita Art Museum for some serious Artcation fun while the kids are out of school! In honor of USD 259’s spring break week, the museum welcomes all children and high school/college students (with ID) Tuesday-Friday for just $1! On Saturday, admission is free for everyone. Try your hand at special art projects in the museum’s living room. Watch an animated movie. Explore the galleries with special gallery guides and games, plus more surprises. Come one day, or come for all!